Unitarian Universalist, with the First Parish Distinguished Service Award. Portland. Thank you, Mary Ann! MUUSAN joined with its partners, the Maine Council of Churches, Maine Equal Justice Partners, and many other organizations and individuals in staunch opposition to this waiver application from the Department of Health and Human Services to the federal government. The waiver would allow DHHS to institute policies directly aimed at blocking access to MaineCare for many low-income Mainers who now have healthcare. MUUSAN's Legislative Specialist Dale McCormick authored an eloquent op-ed: "Maine Compass: The Moral Case for MaineCare," published by the Kennebec Journal May 17, 2017. 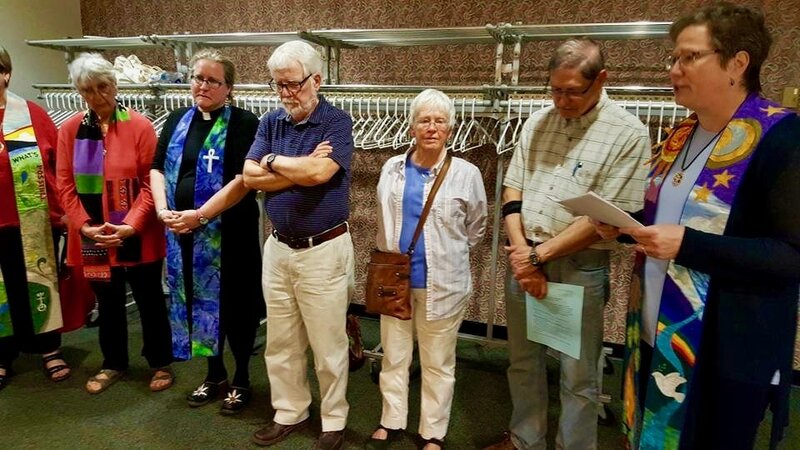 DHHS held two hearings, one at Portland's Cross Insurance Center and the other at the Augusta Civic Center, where Unitarian Universalists participated in prayer vigils, protested, and testified in opposition to this proposed application. Thank you to Rev. Fayre Stephenson of the First Universalist Church of Norway for your presence with clergy. In the crowd, note the yellow Standing on the Side of Love T-shirts worn by several UUs. Thank you to Joan Beal, Jan Cardoza, Dorothy Raymond, and Kerry Read of the First Universalist Church of Norway; Mary Ann Larson, Larry Larson and Angus Ferguson of First Parish Portland UU; Cush Anthony of Allen Avenue UU, Portland; Sue Kennedy of the UU Church of Brunswick; and all other UUs and fellow people of faith who turned out to protest this reprehensible move by DHHS. A warm "Welcome Home!" greeted former First District Congressman Tom Andrews, now President and CEO of the UU Service Committee, as he joined MUUSAN for a day of strategizing about social justice on Saturday, May 13. His inspirational keynote remarks were entitled "Let's Make Waves!" 43 UUs from thirteen Maine Unitarian Universalist congregations attended the conference held at the UU Community Church of Augusta. Opening worship was led by Rev. Drew Moeller and Suzanne Kelley of the UU Society of Bangor. We enjoyed a delicious lunch of homemade soups, salads, breads and desserts provided by Steering Committee members, and were, as always, warmly welcomed and assisted by our host congregation, the UU Community Church of Augusta. In our Annual Meeting, led by Co-Chairs Trudy Ferland and Julia Fitz-Randolph, the slate of Steering Committee members for 2017-18 was approved, MUUSAN's Active Legislation was reviewed and discussed, we were given a thorough review of MUUSAN's finances and development, and a slide show accompanied a litany of this year's accomplishments on behalf of bringing our UU Principles to life in legislative and public policy actions. And for such spirited sharing of our passion for justice in law and policy." The award was accepted by Trudy Ferland and Rev. Margaret Beckman. It was a wonderful day of renewal, fellowship and progress in our work to bring an ethic of love and justice, in the company of our many organizational partners, to lawmaking and policymaking in Maine. Mark your calendars now for MUUSAN's 2018 Spring Conference, Saturday, May 12, 2018, at the UU Community Church of Augusta. 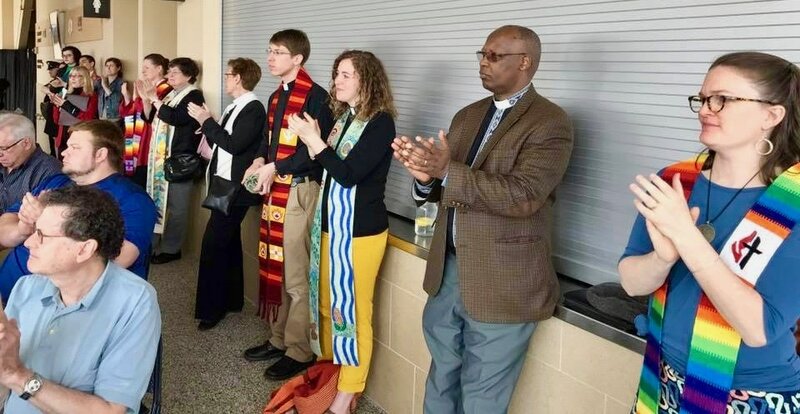 On March 27-28, Unitarian Universalists were well-represented among the more than 130 people of diverse faiths who participated in this first-ever large-scale interfaith training and lobbying event at the State House. Grounded in shared worship and prayer, participants spent a day of learning with theologians and policy experts on the issues of hunger, homelessness, health care, and climate justice. Keynote address by Rev. Bill Barter here. On the second day, participants gathered at the State House, where they were formally recognized by the House of Representatives, visited the Senate in action, and then spoke directly with their individual Senators and Representatives to advocate for just positions on pending legislation. MUUSAN thanks our sponsoring partners Maine Council of Churches, Maine Episcopal Network for Justice, and Preble Street Faith Action Network for all their good work in assembling these two days of witnessing to our faiths' most fundamental teachings of love and justice in our work with legislators. This two-day event is designed to bring people of all faiths together in our state capital to worship, learn, and advocate effectively with Maine’s legislators on the issues of hunger, homelessness, health care, and climate justice. DAY ONE (at South Parish Congregational Church UCC, Augusta, 9:00-4:30): Keynote speakers, panel presentations, and in-depth workshops will give participants the tools they need to become effective advocates who can articulate informed positions rooted in our faiths’ common social justice traditions. Participants register for two workshops (choose from hunger, homelessness, health care, and climate justice) led by policy experts and theologians in those fields. DAY TWO (at Cross Office Building, 8:30-2:00): Equipped with that information and inspiration, participants will visit the State House in Augusta speaking directly with their Representatives and Senators about pending legislation. Grounded in our shared traditions of justice, peace and the integrity of creation, we will strengthen our voices of faith and mobilize for action. A HIGHLY RECOMMENDED TRAINING. Please join us in Augusta on March 27 and 28! mindful of the most vulnerable residents in our state. some of the wealthiest people in our state. Vigil sponsored by the Maine Council of Churches and Maine Equal Justice Partners. Read Rev. Gross's prayer here. The Women's March was a worldwide protest by about three million people on January 21, 2017, to protect legislation and policies regarding human rights and other issues, including women's rights, immigration reform, healthcare reform, the natural environment, LGBTQ rights, racial equality, freedom of religion, and workers' rights. It was the largest single-day demonstration in U.S. history. Maine Unitarian Universalists traveled far and wide to join the Women's Marches — and some also stayed home to organize and anchor local Sister Marches. Several MUUSAN leaders went to our nation's capital for the Women's March on Washington, with half a million marching. UUs from at least 17 of Maine's 25 congregations were identified at the Maine Women's March in Augusta, where 10,000 marched in the largest such event at the State House in Maine history. Meanwhile, UUs helped to lead Sister Marches in Portland (more than 10,000 marching), Brunswick, Houlton, Kennebunk and Sanford. The photos include images from all of those march sites. MUUSAN assigned Ranked-Choice Voting its highest-priority endorsement in the Fall 2016 campaigns for several ballot initiatives presented to voters. Unitarian Universalists in congregations all across our state mobilized to support "YES on Question 5," the Ranked-Choice Voting campaign, spurred by our Fifth Principle commitment to promoting democracy and expanding voter voice. MUUSAN was the only Maine faith-based organization formally to endorse the RCV campaign. We are proud of the hard work done by UUs to educate and mobilize their congregations and to support the Question 5 campaign through delivering sermons; offering special worship services devoted to strengthening democracy through RCV; sponsoring educational forums; providing phonebanking space, county captains, and many volunteers; helping to organize rallies; and writing Letters to the Editor. Rev. 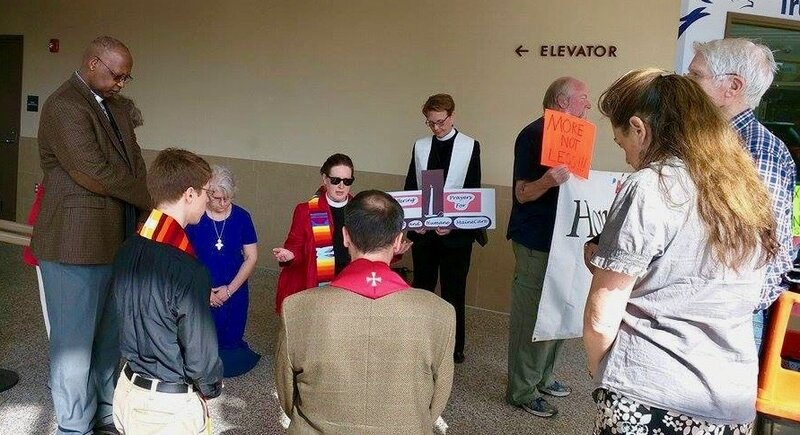 Carie Johnsen (UU Community Church of Augusta) anchored the campaign's Faith Leader Press Conference (photo below) held on the steps of First Parish Portland UU. Following the Nov. 8 first-in-the-nation victory for Ranked-Choice Voting, Maine was recognized in the Jan.16-23 issue of The Nation for having achieved the MOST VALUABLE STATE ELECTORAL REFORM. MUUSAN remains an active, close partner of the Ranked Choice Voting campaign to ensure the speedy and proper implementation of this important new Maine law. Through our activism for strong democracy, we live out our UU faith. Photo L to R: Helen Cunningham, Casco Bay HS Junior (Allen Ave. UU, Portland); Michael Williams (Allen Ave. UU, Portland); Melanie Lanctot (UU Community Church of Augusta); Mary Simpson (UU Community Church of Augusta); Mary Ann Larson (First Parish Portland UU); Isabel Denham (Allen Ave. UU, Portland); Jane Pentheny (First Universalist, Auburn). For MUUSAN, these seven UUs from four congregations made a timely visit to the Lewiston office of Senator Susan Collins where they met with staffer Carlene Tremblay to share their concerns related to climate change. With 2015 just named the hottest year on record, these citizen-activists thanked the Senator for her support of the President’s Clean Power Plan and the state’s efficiency efforts. They asked that the Senator take an even bolder stance by proposing a carbon tax that would finally require polluters to either pay to pollute or invest in cleaner energy. The Maine Unitarian Universalist State Advocacy Network (MUUSAN) is pleased to announce it has hired Betsy Parsons of South Portland as its Administrator. 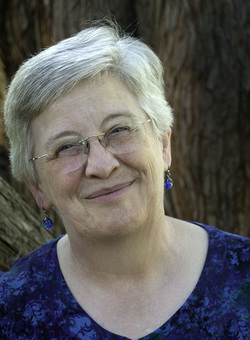 Betsy is a long-time member of the Allen Avenue Unitarian Universalist Church of Portland. Her background includes thirty years of teaching English in the Portland Public Schools and preparing novice teachers in Maine and Massachusetts. She is a longtime LGBT civil rights activist who has been deeply involved in organizing for safer schools through the Gay, Lesbian and Straight Education Network (GLSEN) of Southern Maine. That chapter, along with Downeast GLSEN, has worked to reduce hate language and harassment in schools by helping students establish Gay-Straight-Trans Alliances in half of Maine’s high schools. Betsy holds degrees from Oberlin College, Brown University, and the Harvard Graduate School of Education. She was appointed by Republican, Independent and Democratic Governors of Maine to serve on state educational commissions and was a member of the first delegation of LGBT teachers and students to meet with a U.S. Secretary of Education. Betsy has received a number of awards and honors, most notably the Gerda Haas Award for Excellence in Human Rights Education and Leadership from the Holocaust and Human Rights Center of Maine. She is widely known throughout Maine for her work on social justice issues. Founded in November 2012, MUUSAN gives voice to UU values in the public arena through statewide advocacy. This grant makes possible the next step in becoming a more sustainable and effective organization. With this generous support, MUUSAN has hired a part-time administrative coordinator to expand the base and reach of MUUSAN, regularize communications with congregations, ministers, and social justice committees at Maine’s 26 UU congregations. She will maintain and improve the Web and Facebook sites, distribute a newsletter and “Action Alerts” by e-mail, maintain organizational and financial records, handle correspondence, keep abreast of news related to statewide justice issues, and help network MUUSAN with organizational partners working on our issues.